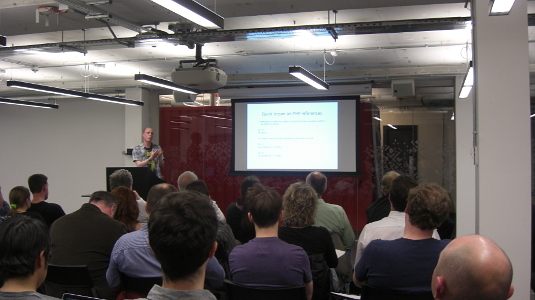 I went to meeting 12 of the WordPress London local group on 16 May 2012, held, for the first time, at the spiffing Google Campus. Scott Cariss (pictured above) led a fairly detailed session, You Don’t Know Query, about how to alter the main WordPress query the correct way by not using query_posts(). Alan Son gave a self-explanatory talk: how to properly setup WordPress for SEO using the Yoast SEO Plugin. I gave the experimental version 0.1 of an introduction to custom post types, custom fields, custom taxonomies and meta boxes (no code!) (53kB PDF). 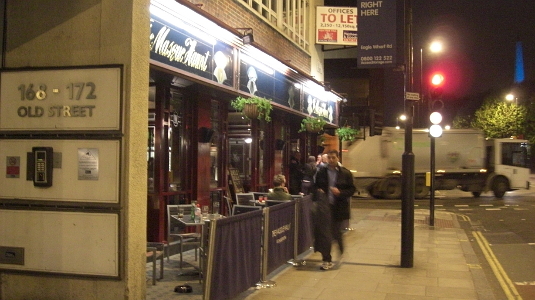 Afterwards it was beers at the nearby Masque Haunt (pictured above).